Low maintenance, attractive metal shed. Double, smooth sliding doors which are fully lockable (padlock not included). Size:	H2090 W3130 D1810 mm	Highest/widest points approx. 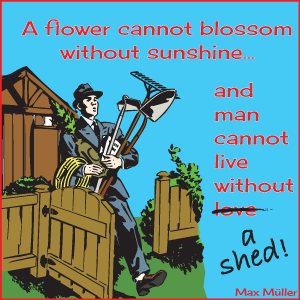 All the charm of a wooden shed but without the woodworm! The Woodvale 10x6 Metal Shed is a fabulous, low maintenance metal shed that has been designed to resemble a wooden shiplap shed. The Woodvale 10x6 Metal Shed is delivered flat packed in kit form with instructions included. 2 person assembly recommended. The Woodvale metal shed is also available in 4 additional sizes - please see Related Products below for details.